Orwell is right about the struggle, and I am nearing the end of the writing process. Thus, a progress report is in order. Sometimes I wonder, Should I laugh or cry? Early, on, I used various props to press “start” on the memoir writing engine. I wrote about the mystery of memoir writing here and gave tips about finding a narrative arc here. 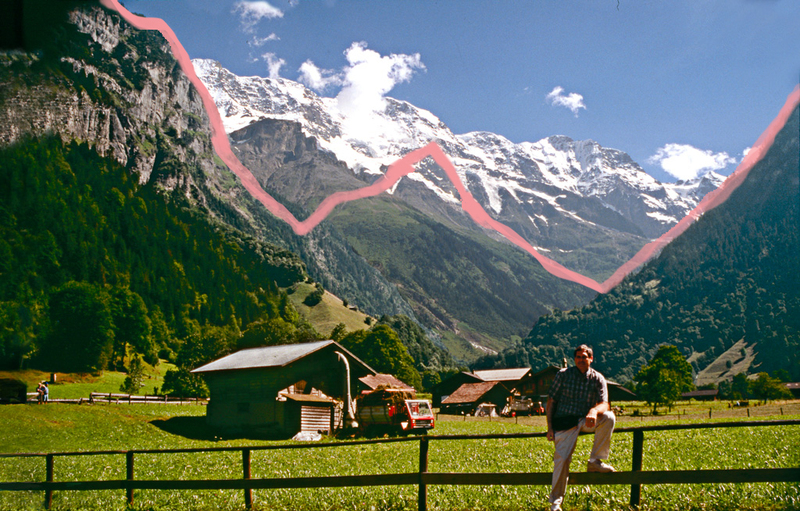 The peaks and valleys of my narrative arc looked a lot like an outline of the Swiss Alps. Writers tend to get tunnel vision. That’s why they need other readers, beta readers, who scrutinize their manuscripts. Beta Readers, now numbering in the double digits, have read my drafts with a spyglass. They used microscopes, telescopes, and periscopes. Some even used prisms to enable me to see the draft from many angles. I gave early readers GUIDELINES to follow with questions like these: Does the story line make sense? Is the main character believable? Where were you confused? Bored? Many readers who requested an electronic copy of my draft used TRACK Changes, balloons in the manuscript margin that suggest additions or deletions. A few wanted a hard copy, which I mailed to them. Suggestions came back with hand-written notes in the margins + other comments, all helpful. Except for my sister Jean who was very helpful with correct names of churches and people in my past, I chose my beta readers because they are published authors whose opinion I highly respect. I sighed because I thought my story theme was obvious. It was to me. so back to the drawing board I went. 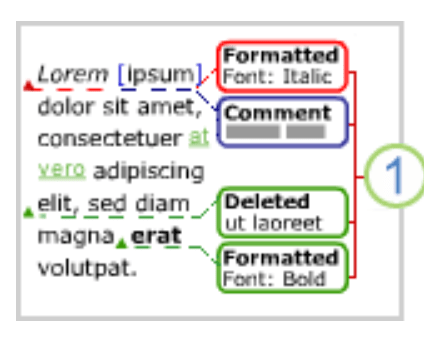 Structure: An example, one of the last chapters now appears earlier in the book. Order of chapters: I changed chapter sequence to improve flow. Verb tense, my nemesis: I’ve concluded verb tense consistency is a problem because I’m writing in the present about events happening more than 60 years ago. Repetition: WHY, or why would I need to say the same thing twice? 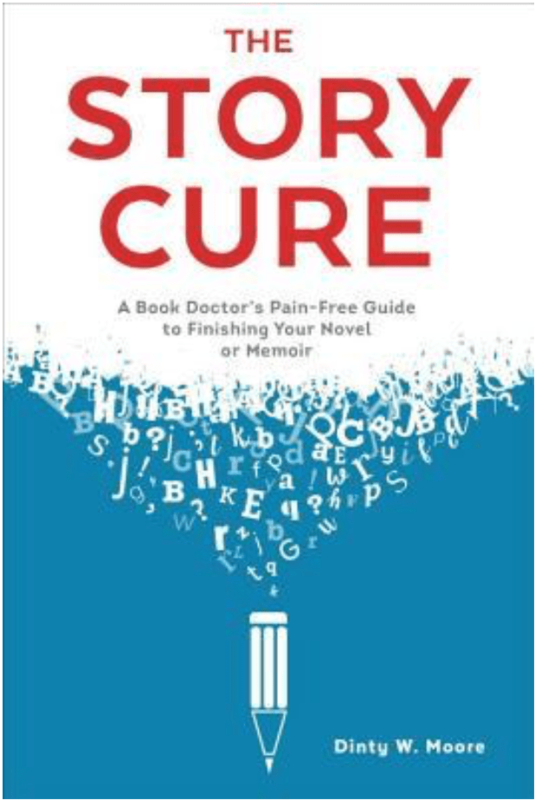 I have followed advice from The Story Cure by Dinty W. Moore, paraphrased here: Take your readers down an Invisible Magnetic River. Help them forget they are reading a book. Invite them to imagine they are right beside you, inside your story. You can read my review of his book here. My working title has been Mennonite in Shiny Red Shoes. While this title serves as one metaphor in my book and shows my desire for a fancier life, the title is not a Bingo: And while it does fit one major theme of my book, it’s too derivative of other Mennonite memoirs: Mennonite in Little Black Dress / Mennonite in Blue Jeans. My editor may have other ideas! 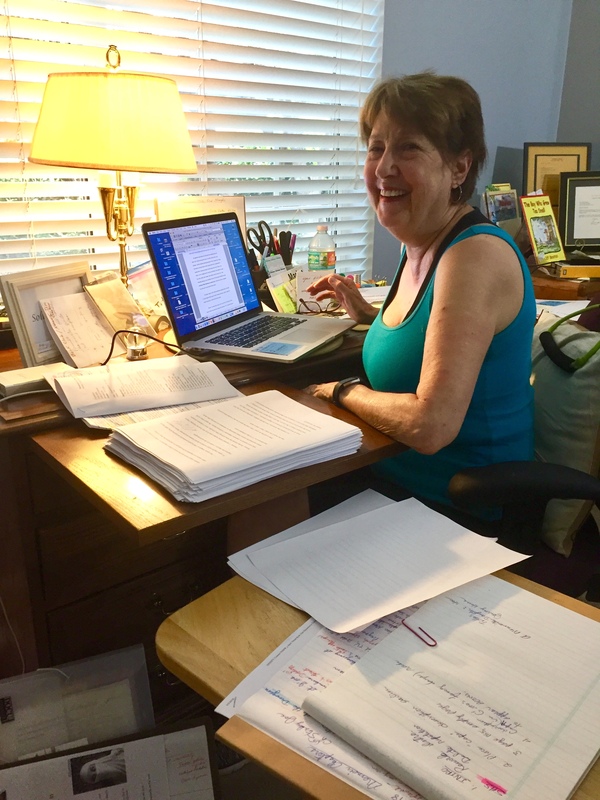 Often at my desk I have been so “into” a scene that when I looked away from the manuscript, I was surprised to find I was at home in my writing studio and not trying on hats in my Grandma Longenecker’s kitchen long ago, a pleasant memory. If the scene was difficult to re-live, I was there too. If you don’t recount your family history, it will be lost. Honor your own stories and tell them too. The tales may not seem very important, but they are what binds families and makes each of us who we are. What parts of this post can you relate to? Your suggestion for my memoir title? Thank you for sharing the anecdote about shoe shopping with your parents. So I’m not the only one who likes red shoes. Someone took a photo of me wearing high-heeled shoes at a slightly younger age. I have no idea what color they were because the picture was black and white. And thanks for starting the conversation here today, Carol! I am looking forward to the finished product. It sounds like you chose your beta readers well. Constructive criticism is just what the name implies – it’s all about building. In this case it’s building a better story. Thanks for cheering from the stadium, Arlene. I value all this encouragement! Just a few off the top but you have some other great lines in the draft I read that could be picked up and played with. I’ve been pondering my own drive for what I think I want to do–write a work memoir from my life working in Mennonite media, but have been second guessing myself, will anyone else really care? Or, will enough people care to buy it and read it and review it! L’Engle’s line rephrased might be for me: “If you don’t recount your incredible years producing media for the Mennonite church, it will be lost.” … That’s for another day. I think you’re hearing a nudge in the direction of memoir too, Melodie. After all the cookbooks, essay-writing and editing experience, you are highly qualified. Maybe give yourself a wee break though. On second thought, the brain wheels keep turning even when we’re not actively writing. But you know that! I certainly relate to Orwell’s quote, Marian. These days, I find myself crying more than laughing. Your photos are fantastic, particularly the first one! I’ll be anxiously waiting to get your memoir in my hands. Your book is in my hands now, and I’m hooked! What amazes me most is your skill with dialogue and all the sensory details that draw me into your novel. One day I’ll finish it and write a review. Good morning, Marian! I’ve been with you on part of this journey. 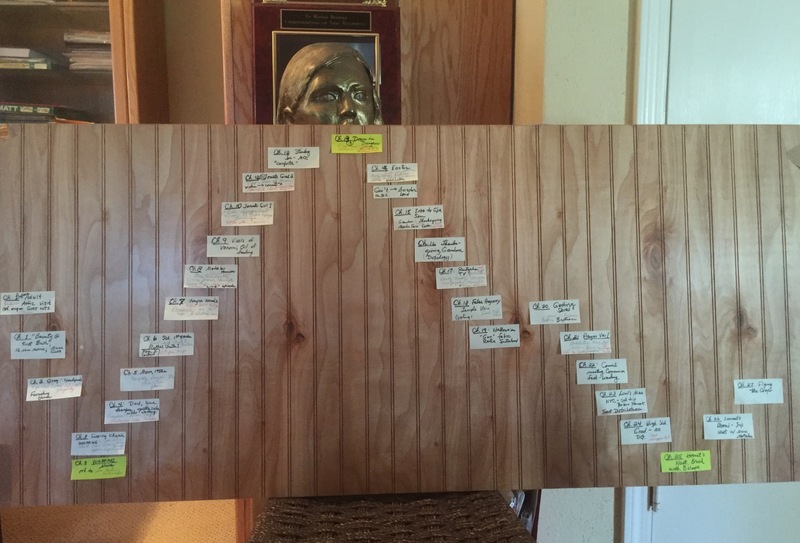 I so admire how organized you are, and how willing you are to keep on with this project to make it the best it can. It’s funny, I was listening to something the other day that reminded me how your voice comes through in your work. I always feel like it is Marian talking. There is something about the syntax and wording, too, from that part of PA when you were growing up that flavors your writing. Titles are so difficult sometimes to come up with. I think the second proposed title sounds too academic. Could you perhaps combine the two: I Was Mennonite: A Daughter’s Quest ? Or perhaps it should be a quest for something or journey to something . . .
I’ll hold on to your “voice” comment as I plow through another round of revisions/edits this month. And I’ll also hold on to your thoughts about title. Thanks too for steering me through the rough patches in your review of my working manuscript in the spring, so appreciated, Merril. You’re welcome. Good luck, Marian! You got me counting numbers, Marian. My memoir took 7 years and 7 months, start to finish (publication). Five separate editors, and a myriad of how to books. You’ve certainly pulled from among the best. What helped me most was Eric Maisel’s book on writing a proposal. He helped me understand the value of finding that universal theme, that underlying thread that all your readers will relate to, even those who didn’t grow up Mennonite. That to me is always “what a story is about.” Childhood rebellion, knowing where you belong, listening to your own heart rather than those outside, any of these (and others) could be that thread that weaves the individual scenes together, helps you decide which scenes to keep and which ones to kill. It’s a fascinating process. I miss the intensity of it, some days. My best wishes to you. I’m envious. Your suggestions are very helpful, Janet. Yes, my editor now tells me “Make sure you have a takeaway as you write, and a universal theme pulling the reader along. You have told me before that you miss the intensity of the writing process and even assured me (once) that I would miss it when then book is published and marketed. I will have to take your word for it because right now I’m “in the weeds” and wishing for it all to be behind me. Envious? I can’t imagine . . .
I’ve never attempted to write my memoir because like all of your advice above suggests, it’s difficult to do. I admire you for how you’ve gotten to a point where you are clear about your process plus clear about who you were/are. I look forward to reading your finished product, no matter what you decide to call it. Creating a title for a blog post is tricky enough, can’t imagine deciding on a title for a memoir. Proofreading is definitely the most difficult aspect of writing for most writers. I do best if I step away from my blog for a day or two, then re-read my draft; grammatical & syntax errors become more obvious. And, when approaching it as a reader, I’m much more likely to realize the order of ideas needs to be adjusted. You’re fortunate to have gathered so much constructive feedback from beta readers. Sounds like you’re well on your way! I can’t wait to read your published memoir. I have written academically with some success over the years, but in attempting memoir I had to acquire a whole set of new skills. Sort of like riding a bicycle backwards, it often feels awkward. Re-reading your draft is a great idea and also using spellcheck. I wonder if you read it again out loud. Thanks for your kind thoughts, Lynn. What a great post, Marian. I am going to recommend it to all aspiring memoirists, and I might steal a few of these quotes in the essay I will be writing later this year for a possible book about memoir and its ethical challenges. I do know how hard this process is. I found that sitting at a computer day after day was more demanding than anything else I did to my body after the age of 60. Cheering you on, as ever. Sharing Shirley, that defines you. Thank you! I am thrilled when my posts resonant with other writers, especially those learning the skill set of a new genre. Linda Myers, in the first memoir-writing course I took years ago, emphasized the toll writing takes upon the body. I thought then that she may have been exaggerating, but I know now the wisdom of her words. I am happy to see you sitting with your book of memories as you ponder your life at 70. I imagine you may show us the cover of the book in a future post. Kate was so eager to surprise you with this collection! I think Mom would too. Like you, I remember they both used the word “implement” instead of “equipment” referring to what Daddy repaired and sold. Thanks for chiming in, Jean. Marian, I know your memoir is going to be a huge success because of the way you go about your writing and being in the world. This post tells me you’re a superhero among memoir writers. I admire your patience, your ability to tell wonderful stories, and your cast of amazing characters who constantly fill the pages on your blog. I can’t wait to read it!!! Well, Joan, I don’t feel like a superhero but I accept your assessment at the moment. I can’t imagine going through this arduous process without the support of writers like you. I am following up on your suggestions for next steps when we talked recently. Thank you for all of this! Marian — And while I don’t wrestle day in and day out writing memoir, I, too, daily wrangle words onto the page. You’ve nailed the writing process beautifully. It’s NOT pink fuzzy slippers and chocolate bonbons. As to the title, could you leverage the “nite” part in Mennonite and use the word “day” in the subtitle? Not in a “cute” way, but in a way that conveys transformation, tremendous change (i.e., nite to day). I just ate a chocolate bon-bon (4, actually!) but you are right about the writing process. Maybe celebrities wear pink fuzzy slippers as they converse with their ghostwriters, but not us. We are the genuine article! Marian, this post is very helpful to me, and I will keep it as a reference guide. The idea of writing a proposal sounds like a very practical step in sticking to a theme. Congratulations on all the work you’ ve done! I like Melodie’s title: “No Dancing Shoes”. I am glad you found this post helpful. And I am happy to scatter some “bread crumbs” if it helps other writers. Each writer’s journey/process is unique, though, just like the stories they tell. Thanks for being such a faithful follower, Elfrieda! Oh, sweet Marian! You’ve been working so hard at this and still finding time to keep your readers well informed. I appreciate your teaching points from your process, the quotes and references from others, and how you chose your beta readers. As I struggle to feel well enough to get back to my own wip, these are helpful and motivating words you’ve shared with me and others. I love the title about the shiny red shoes! and I love you, Marian! Thank you for your sweet words, Sherrey. Lately writing has become a pain in the neck. Tomorrow I hope to get on the hydromassage chair at the gym and see if I can get relief. The Pilates class that follows also helps with the aches and pains. Congratulations, Marian. What an accomplishment! I think your post is very helpful to writers, and I agree, that writing our stories is a gift to the future, as well as an act of reconciliation and peacemaking within ourselves (and possible with others, and for readers). As for a title — not having read your memoir, from the 2 titles you’re considering now, I’m thinking your story is about father-daughter relationship and how the culture in which we were raised imprints on our lives. Does that fully answer the question of what your story is about? Is there something more specific in your story that you could put into the title that would grab my interest? I’m thinking of Shirley’s title: Blush: a Mennonite Girl Meets a Glittering World It really tells me what the heart of the story is–the collision of value systems in a young woman’s life. You nailed it exactly: My story unfolds with two parallel themes: my father/daughter relationship and the Mennonite culture in which it developed. The trick is to capture those themes with an elegant title that gets (as you say) to the heart of the story. I’m happy to have you alongside on this journey, Tracy. Thank you! I don’t know how it is for you, but I tend to think in large abstractions and myriad connections, making it really hard to laser-focus on the “one thing.” I’ve been writing all my life, and have never really successfully pulled a book together, because I resisted narrowing down to that one-sentence-soul of the story. Here’s a link to a 2-paragraph article I found today, which you might find interesting and helpful, as I did in finding the words to identify the soul of my story. Had we not been having this conversation here on your blog, I would have overlooked this link in my inbox. But, synchronicity happened, and taking five minutes to click and read made a light go on for me. Thank you, Marian. These days I’m finding almost no time to blog or read blogs, but I do still regularly peek in on your and on Shirley’s blogs, because both of you always make me feel happily connected to something bigger than my own little story! You say that “you have never really successfully pulled a book together,” but I beg to differ. I enjoyed Toward Daylight, both memoir and travel guide. For me as reader, the combination worked. Thank you too for the link about the soul of story, which offered clarity to me. Blessings, my friend! Blessings to you, too. Marian. I’m glad you enjoyed my memoir/travel guide. Perhaps because of what came after, I feel it was unsuccessful because it didn’t tell the “real” story. But then, when I was writing it, I didn’t know what would come after. And reading it now is a painful reminder of how my relationship with Ken was, and how much I’ve lost. That will change, too, I imagine. And some day I might like it again. In any case, I’m sure I’ll be glad I captured the stories. I’m learning we probably shouldn’t judge our own writing. Just write, and leave the reading and response to others. Memoir captures a slice of time, and we can’t know what will come after. I know for sure that had I written about the first 23 years of my life years ago I’d have a different story because I was a different person then. Like me, you are an analytical personal, but I think you arrive at a wise conclusion with your last paragraph. Prayers for you and Ken! My title, Book of Transformations came to me through a Stanley Kunitz poem, which Shirley Showalter reminded me of a number of weeks ago when she mentioned it on Facebook. It felt almost like waking up from a dream — (poetry does that to me.) I’m sure your “dream” or poem or literary epigraph will come to you soon. I suggest you don’t overthink it or work hard to find it. Just pray for it, then open your intuition so you will spot it when it shows up. (I also just said a little prayer that your title will soon be delivered to you). I’ll credit Stanley Kunitz for the title in my epigraph, of course. You are so encouraging, Tracy. The title is now an item on my prayer card on which I can record dates of answered requests. It’s just a matter of time! Again, thank you, thank you! Oh Marian, You have me dancing, imagining you in all the phases. I feel that you are very close to offering us a way to pre-order your book. I can’t wait! I like the idea of dancing, but I still feel too much “in the weeds” to kick up my heels. Thanks for cheering me on though, Dolores. Remember Mr. Ben [Vogt]? Maybe one day I’ll contact him about ordering my book. Yes, I remember exploring Ben’s suggestions along with you. Yes, it can be a pain in the neck – the WIP feels like whip lash sometimes .. You’re doing great Marian! Thanks for keeping us updated about it all. Reading it out ALOUD to yourself can help with rhythm, nuance, repetition etc. Of course an ‘etc’ never to be in a sentence! Red is a positively energetic colour – maybe keep this at least as background colour or have the red shoes featuring somewhere in the title – ‘The Dancing Mennonite’ comes to mind. Dear Susan, you may have read my reply to Sherrey above in which I explain my literal pain in the neck. You have been through this and know from personal experience how hard it is and body and soul – and how rewarding. And, yes, I’m at the point where I should read my manuscript aloud again to hear how it sounds and make changes. Thanks for all your tips, including the lively title suggestion, Susan! What an amazing road you have walked whilst writing your memoir Marian. Do you think you will be a little sad when your finish 🤭🙄 no she says 😂 . 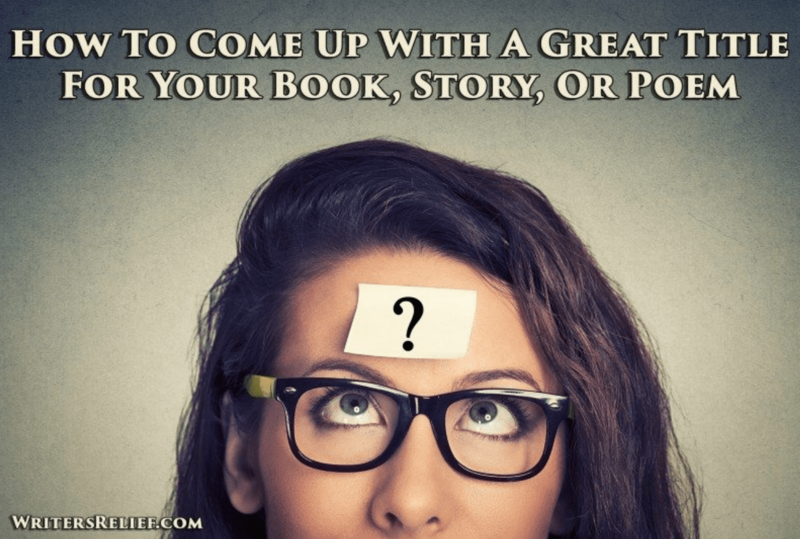 Will you publish your book ? I blooming well hope so because I want to read it . I love all the helps and hints listed in your post and the book recommendation , I will gather them up like a squirrel gathers nuts , I could certainly do with it right now . Yes, I “blooming well” must finish this thing! I love how you express yourself as though we are talking face to face. How lucky we all are to “sit in class” as you show us your path in writing a memoir. Nothing could be as vulnerable as exposing our lives to a known and unknown audience, maintaining a balance of truthfulness and neutrality. Thank you for taking us along on this journey! You mention vulnerability and balance, both hallmarks of the memoir journey. I sometimes think that I should have begun my memoir sooner, but now I realize t am more open to being vulnerable. Also, not long ago, I have found keys to possible motivations of main characters in my life that weren’t available earlier. I will keep your words in the forefront of my mind as I write: “Nothing could be as vulnerable as exposing our lives to a known and unknown audience, maintaining a balance of truthfulness and neutrality.” Thank you for this, Ginger! So glad you’re nearing the end of the process… I always find the end the biggest struggle though with all the revisions and editing needed. I think you are right about that. First of all, writers are SO tired at this stage. And then taking care of all the details involved including interaction with editors, book designers, and others.Thanks, Fiona! I love the Madeleine L’Engle quote and have long wanted to sift through some family treasures and record family stories. If I keep waiting for the right time, I may be out time. Be blessed, my friend! You’re right about not waiting for the right time. But take heart, dear friend, I started way, way later ~ after I retired from teaching. I am blessed, and I know it . . . so are you! The most fun will be the finish, or so I imagine. A few authors have told me they miss the challenge, working through the manuscript. Is this really true, or are they masochistic? You have plenty experience with multiple books, so your opinion matters. Thanks, Debby! 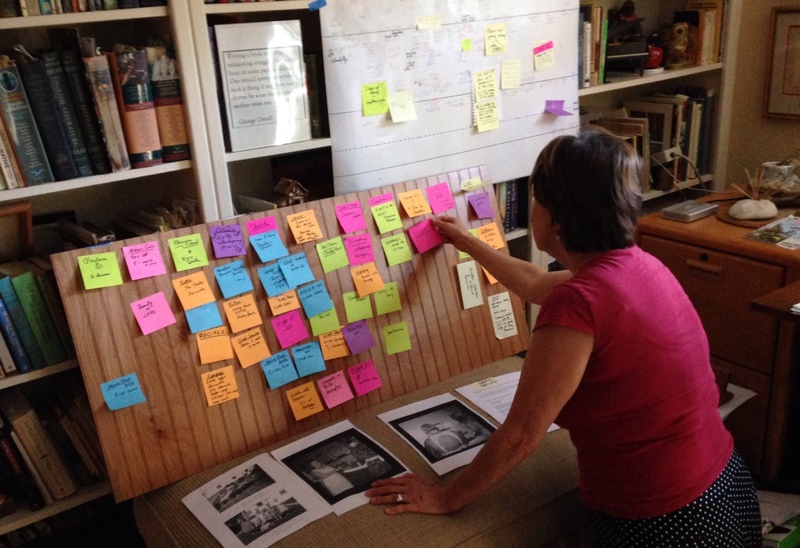 Thanks for sharing your slant on the writing process here, Debby! You’re echoing what I’ve heard. Oh, vay! I can take criticism. . .is the word “Mennonite” necessary in this title? I was raised in the Mennonite church. Hi, Jane. According to many of my readers the word “Mennonite” is necessary in the title for digital search engines (and thus, readers) to find my book. I believe published authors know more than I do at this point, so I’m going with that right now. Thanks for the comment with the question! Thank you, Marian. I understand and I believe you are correct for including it. I look forward to reading your book. I can totally relate to this post! That quote of Mary Karr (“Writing memoir, if it’s done right, is like knocking yourself out with your own fist.”) is totally fantastic. Yes, writing a memoir (or any book, probably) is a lot of work. In a couple of weeks, I’ll be in the stage where you were a while ago, when my beta readers will send me their feedback. A bit scary, but it will be incredibly helpful. Coming up with a title is really difficult. I have had a working title all along, which I never thought would become the real title. Yet, it still speaks to me. I have a few contenders and it’s one of the questions I had for my beta readers. Like you, I had a list of specific questions and no matter how (and even if) they are answered, every form of feedback is appreciated, helpful and a huge favor! We are on parallel tracks, Liesbet. A frequent commenter, Kathy Pooler is right alongside us too. Memoir writing is the “thing” right now, so we are among good company. For months, my writing studio has been a HUGE mess. Last week, anticipating house guests, I began to clean up, sorting through stuff and trashing or assigning a home in my filing cabinet. Guess what? I found a title I had written down in pencil, and with a little tweaking, I think will work. My editor may or may not agree. Fingers crossed! Onward, Liesbet! I relate to how difficult this process is. I haven’t been able to complete a second book, but instead keep focusing on submitting articles–some accepted, some rejected. Now, as I prepare for a workshop I’m giving on Aging, Loss, and Grief with examples from Greek mythology, I may be on the track of something. First, I need to create a great workshop and not get ahead of myself. I’m doing lots of writing for this. There is no hurry. No legacy to preserve. I love being captured by the writing process as you describe so well, so I’ll keep chugging along and see where the train takes me. And, yes, titles are hard. I struggle with them for most things I write from blogs to workshops to my book. Everything needs a catchy title that lures a reader and gives them a hint of what they’ll experience. It will come. I had titles and key words all over my counters (like your notes, but not as neat) and finally one popped out. Oh, that’s it! For the last year I’ve been trying on titles for size, much like shoe-shopping. You can tell my frustration in this post. However, this past week I went through my piles on the floor and found a title I wrote down in pencil some time ago. With a little tweaking, it may be my “Oh, that’s it!” It’s short (just 6 words) and metaphorical. We’ll see . . . I appreciate your assurances here; thank you for them ~ and for your friendship, Elaine.